Use these five tips to improve your wildlife and nature photography skills and enter the Digital Camera Photographer of the Year competition for free! There's nothing like getting back to nature with your camera. Whether you're shooting action shots of animals on the go through a telephoto lens, or wide-angle scenes of creatures in their thousands, there's nothing more satisfying than nailing that shot. But what makes a great wildlife and nature photograph? Here are five pictures from the Wildlife and Nature category of Digital Camera magazine's 2019 Young Photographer of the Year and Photographer of the Year competitions so far. Make sure you enter your shots now to be in with a chance of winning some amazing prizes! You don't need to go far to get that amazing shot. Take, for example, Kyle Moore's photo of this city fox. Kyle used flashguns to create the feel of a nightclub with neon lights. 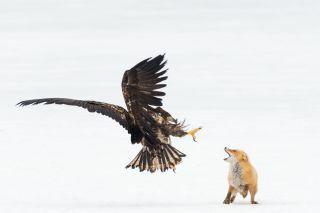 He also shot using a remote control so that he wouldn't disturb the fox from his mission. By learning the creature's habits and placing yourself out the way, you can get some great results. Close-up scenes are great for some setups, but there are times when the wider angle gets the more spectacular result. This image taken from a drone by photographer Andrew shows the sheep being herded from one paddock to another. The funnel shape of the herd creates this great shape from above and the sheep look more like grains of rice than animals. Often a simple approach can get the best results. Flowers make a great subject to shoot using a shallow depth of field to create bokeh shapes in the background. For best results open your aperture as wide as it will go and isolate your subject from any background clutter. It helps for the background to be subtly lit to make those bokeh shapes twinkle! Our relationship with animals can be just as interesting subject to explore as the animals itself. Take for example this image shot by Sam Prime. The silhouettes of the figures in the foreground watching the creature create a great frame for the ray to sit between. As well as being a great wildlife shot, this image also takes on a documentary angle by blurring the lines between the genres. There are times when the black-and-white medium lends itself to this genre. This image taken by photographer Philip Field in Serengeti National Park, Tanzani, has been processed to have a high-contrast finish. Philip says, "Due to the low light and composition of the image, I knew when shooting this image is would work better in black and white and so converted the exposure in Lightroom and increased the contrast to create a more dramatic and eye-catching image."